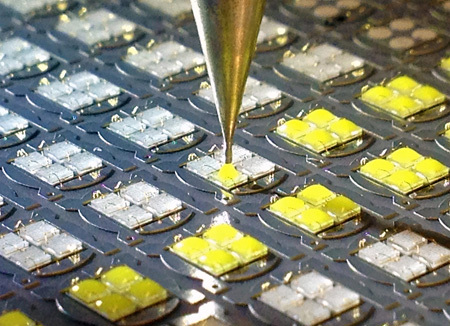 Repeatable encapsulation of LEDs is a must to generate a good quality product. LED encapsulations are typically low viscosity and have a pot life that can vary from a few to many hours. Until now, it has been very difficult for common dispense technologies to generate acceptable results for rapidly changing fluid viscosities. LED Encapsulation Fluid Dispensing - video. Syringe Mixer for Dispensing Fluid - video. To further complicate the issue, the encapsulant has a mixture of phosphor that has been mixed to create a particular light output. PCD technology, being continually volumetric, delivers consistent dispense results throughout the fluid pot life and the level of fluid in the fluid reservoir does not affect results. The true proof in dispense repeatability, however, occurs when the light output is measured. PCD technology has been proven to deliver outstanding light output with output samples taken at different time intervals and when different levels of fluid are present in the syringe. Phosphor is mixed into the LED encapsulation and begins to settle when fluid motion ceases. We have developed a syringe mixer that maintains a uniformly mixed phosphor even when dispensing remains idle for more than an hour. PCD technology coupled with a uniform phosphor mixture results in LEDs with tightly grouped light output. Phosphor is an abrasive additive and causes wear on many dispense technologies. PCD technology pushes fluid through the pump without smashing fillers. Because fillers are not being smashed they are not causing wear. Life testing of PCD components with up to 15% phosphor loading shows outstanding resilience to the fluid components. PCD technology excels with larger LED encapsulation. Highly repeatable results are achieved with an effective dispense rates of 3 ml/min. No other dispense technology can meet this dispense rate at the consistency of PCD. To deliver the fluid to the substrate we exclusively use our S Type taper tips. S Type tips enhance fluid flow and ensure smooth delivery of fluid to the surface.